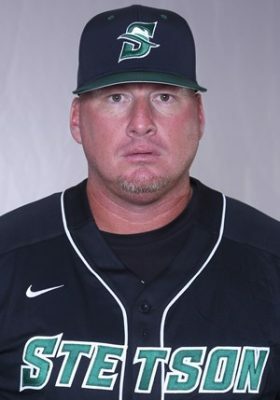 Stetson University’s Dave Therneau has been selected as Collegiate Baseball’s National Pitching Coach of The Year for 2018. Entering his fourth season as the pitching coach at Stetson, Therneau will be the 16th recipient of this award at the American Baseball Coaches Association Convention in Grapevine, Texas, this January. The winner of the award is selected by a vote from past winners. Therneau was a unanimous selection for 2018. “Obviously, this is a tremendous honor that I am humbled by,” Therneau said. “To be honored, and a unanimous selection, by your peers, with all the great, accomplished, coaches out there is something I do not take for granted. “The biggest thing is the work and belief the players have put in since I have been here that will not be written about. They believed in the system and the program and put in the work. As a coach, you reap the benefits of the accomplishments of your players, and we had the best season on the mound in the history of our program. 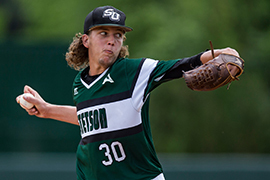 The year prior to Therneau arriving at Stetson, the Hatters had 379 strikeouts. Five pitchers were drafted after last season including Logan Gilbert who was a first-round pick by the Seattle Mariners. He led all NCAA Division I pitchers with 163 strikeouts, joining with Jack Perkins and Mitchell Senger to make the Hatters just the second program in NCAA history to have three hurlers record 100 or more strikeouts in consecutive seasons (Rice, 2002-03). Brooks Wilson tied for the NCAA lead with 20 saves. The Hatters tied for the NCAA lead, and tied the school record, with nine shutouts during the year and the staff posted the lowest team ERA (2.66) of the aluminum bat era. In addition to shutouts, strikeouts, saves and ERA, the Hatters led the nation in fewest hits allowed per nine innings (6.81) and WHIP (1.11). Stetson was third in the nation in K/9 innings (10.5) and K-to-BB ratio (3.31) and was fourth in winning percentage (.787). The Hatters also allowed the lowest opponent batting average (.207) and allowed the fewest extra-base hits (90) in the aluminum bat era. Therneau enjoyed a highly successful eight-year stint as the pitching coach at Embry-Riddle prior to coming to Stetson as the Eagles made seven trips to the NAIA World Series. During his tenure at Embry-Riddle, Therneau’s pitchers combined to earn 17 All-American honors, while eight were selected in the Major League Baseball draft. In 2010, Embry-Riddle’s pitching staff led the nation in ERA at 2.63, and the Eagles ranked among the top 10 teams in the nation in ERA in seven of Therneau’s eight seasons. Therneau is the second to earn this award with ties to Stetson. Former Hatters pitching coach Derek Johnson won the award in 2004 while serving as the pitching coach at Vanderbilt. Johnson, who spent the last three seasons as pitching coach for the Milwaukee Brewers, was hired earlier this month as the new pitching coach for the Cincinnati Reds.